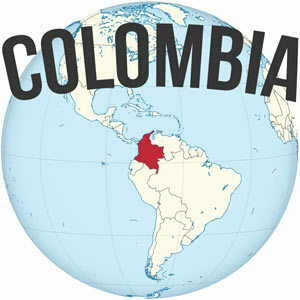 Looking to set out on a big trip or some other long-term travel? Some people haven’t been able to make the leap due to fear and related worries. Others can’t make the leap because they are up to their eyeballs in debt and can’t put any money aside to travel. If you talk to your friends about the things they love to do most, 90% of them will probably mention travel. But how many of them actually prioritize travel? If you want to do something, I mean, really want to do something. You can find a way. You might have to sacrifice other things along the way but that is part of the process. The first blogs I started reading were personal finance blogs, then I moved on to more in depth financial literacy books. I’ve heard all the advice and heeded much of it, it’s just part of my lifestyle now. A solid financial foundation provides the springboard to every other opportunity you might want to pursue–whether it is long term travel, buying a house, or becoming an entrepreneur. Money isn’t everything, not by a long shot. But many people allow money to become the ruling factor in their lives. Let’s dive into the money issue here and now and how we can live a life rich in experiences, not in things. But what happens? We don’t put that money away, we just spend it. There are doctors and lawyers living paycheck to paycheck. It doesn’t really matter how much money you make if you continue to spend it all. Do not succumb to lifestyle inflation. I was able to afford this lifestyle by (for the most part) continuing to live mostly like a poor college student long after I was gainfully employed. The 80/20 Rule dictates that a very small portion of your time, your house, your things, etc. sees the vast majority of your use. You probably wear the same two pairs of jeans 80% of the time. You probably spend 80% of your time in 20% of your house. And on and on. Get rid of all the junk that clutters your house and your life. The things you own end up owning you, and they absolutely hold a significant psychological weight over you. The less you own the less you have to worry about. It’s when we get caught up in the more is better, bigger is better line of thinking that you should be worried. Ideally, start selling whatever you can on Craigslist and eBay. If it won’t sell, just donate it to Goodwill. The hardest thing in the world is to simplify things. It is far easier to complicate life. Read more in my post about Downsizing and Minimalism for Long Term Travel. The two steps above will send you in the right direction for conquering your debt. Curb your lifestyle inflation and sell unneeded belongings and you will be able to pay down your debt more rapidly. When you have no debt to worry about, you are freer to actually make the decisions you want to make in life. You CAN quit your job, you can travel, you can pursue your own business. Two great reads on this subject are Your Money or Your Life and Total Money Makeover. Spend money to learn things and have more amazing experiences. Stop spending money on superfluous things. That’s what I mean about Stop Buying Things and Start Doing Things. If you do have a mountain of debt that is being charged interest, you could look into 0% balance transfer, $0 fee card like the Chase Slate. You can get a major reprieve on your payments with that simple step. My back of the napkin calculations tell me that if you had $5,000 in debt with 18% interest, and you transferred that balance over to the Chase Slate card for no fee and a 15-month 0% APR, you would save more than $1,000 in interest payments alone. All of which could go directly to paying down the principle, and paying it down much faster. This is all to say that there are unconventional options to surmounting your problem with debt. Time to take an active role, not a passive role. Conquering your debt is a big process. If you’re looking for a more comprehensive solution, I’d strongly recommend checking out J.D. Roth’s Get Rich Slowly Guide, which is an affordable year-long course delivered straight to your inbox and will help you get things under control. The two books mentioned above are really excellent resources as well that will change your perspective on personal finance. Setup all of your bills so that everything is taken care of, each and every month, automatically. Cell phone bills, cable bills, rent, etc. all of that comes out of your bank account or goes onto a credit card automatically. This was a great piece of advice I took away from the book I Will Teach You To Be Rich. Ideally, set up your bills to be paid by a credit card with a rewards bonus that would earn you airline miles, free luxury hotel stays, or cashback bonuses that will allow you to travel for free (something I talk about in length in my book Big Travel, Small Budget). Then your credit card is set up to automatically pay the balance in FULL from your bank account each and every month. 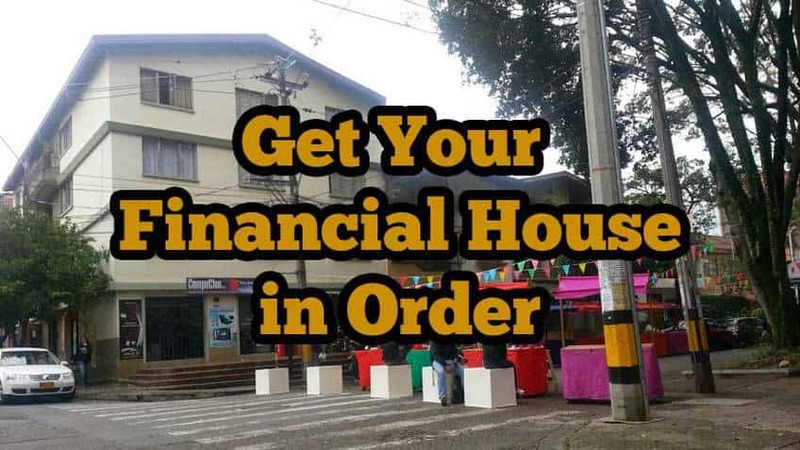 In this scenario you actually come out ahead–you pay nothing to the credit card companies, you never get hit with any late fees or other fees, and you can earn rebates or free travel on the spending you already do. Win-win-win. If you are struggling to pay off existing credit card debt, just make sure that you are automatically paying a predetermined amount (well above your minimum payment) each month, and use one of the debt repayment methods I talk about in my Conquering Debt Mountain article. Automation leaves you with less to worry about and leaves no room for error in terms of late fees that will only add to the problem. Many people put blinders on related to money and don’t know where they stand exactly. If you don’t really realize that you are spending $150 per month on unhealthy fast food, then it’s hard to cut back and save for what you really want. I’ve been using Mint.com for years to track my finances, and I give it a lot of credit for helping me take control of my financial state. Sign up for Mint, a totally free and secure service that allows you to put in the information from all of your accounts (bank accounts, credit cards, investments, etc). I try and analyze my spending in terms of opportunities lost… Maybe I really want a pair of $100 noise-canceling headphones, but before buying I think to myself would I rather use that $100 for an extra 4-5 nights of lodging overseas? Maybe, maybe not. But you should at least ask yourself a similar question for every big purchase, and for all those little purchases that add up. Of course, be sure to spend less money than you make on a monthly basis or you are just digging the hole deeper. Mastering your money situation is the biggest and most tangible step toward achieving the lifestyle you want. Struggles with money will derail it every single time. What do you struggle with in regards to personal finance? Stop Buying Things and Start Doing Things – Experiences are what really count in this life of ours, not things. Downsizing and Minimalism for Long Term Travel – Conquer your obsession with things to free yourself. Do You Have a Trust Fund? 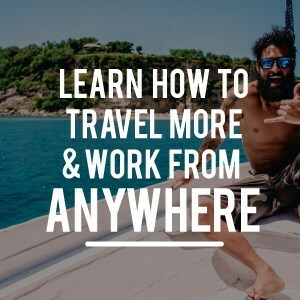 Thoughts on Financing Long Term Travel – You don’t have to be the son of a business tycoon to travel the world. Budgeting for Your Next Big Adventure – What you need to know when planning for a major trip. 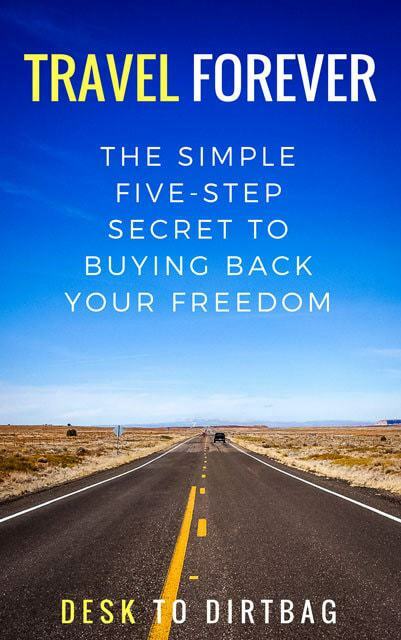 The Best Financial Literacy Books – Learn about how to best handle your money so you don’t frivolously lose it (time is money when you get paid by the hour). 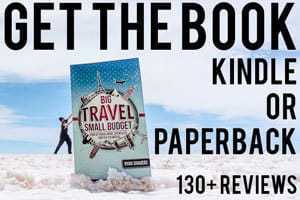 Big Travel, Small Budget – My best-selling book that talks at length about how to travel much longer for much cheaper. Amen to these tips. I became a minimalist by habit, or by necessity, doing the long term travel bit. I sold all my stuff except for a set of clothes, a suitcase, a laptop and a tablet. I store some clothes at home but not many because I need only a few pairs of pants and shirts for my Christmas trips back to NJ. Car gone, apartment gone, all gone, and I’ve never felt more free AND have never made more money in my life. That’s the irony. When you lighten up, and relax, and let go stuff you should let go, money, and money-making ideas, will find you steadily. The key is to let go, to sell stuff you don’t use and to be open to prospering channels, like monetizing your blog, etc. Do that, pay off your debts and your money problems will disappear forever. It’s a simple matter of letting go what needs to be released. Thanks Ryan! Tweeting from Bali. Once you realize how freeing and happy you can feel with just a backpack full of stuff, you don’t necessarily have the desire to load up your house with belongings and other random things. The real power comes in recognizing what is important to you–and cultivating more of that–while recognizing what isn’t important–and trying to eliminate it or minimize it. Thanks for the comment, Ryan, you always add to the discussion.